What beats a pair of Jacks? Three of a kind, of course. Jack Nicklaus and his son, Jack II, headline a field full of World Golf Hall of Fame members, golf legends and their children when the PNC Father/Son Challenge tees off for the 17th time Saturday at The Ritz-Carlton Golf Club, Orlando, Grande Lakes. Jack Nicklaus III, age 24, will join his father and grandfather as caddie, making the Nicklauses the only team in the field to feature three generations. Tournament coverage of the PNC Father/Son Challenge will air on Golf Channel from 2 p.m. to 3 p.m. ET and on NBC from 3 p.m. to 6 p.m. ET on Saturday and Sunday. Golf Channel also will air a Pro-Am Special today at 4:00 p.m. ET. 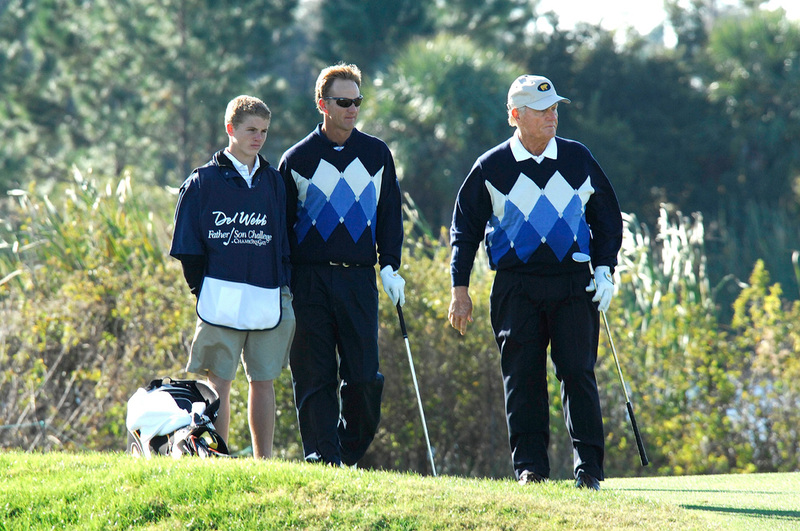 Playing in his 12th PNC Father/Son Challenge this week, Jack Nicklaus will be joined by Jack II for the seventh time. At a combined 127 (74+53) years, they represent the oldest team in the field, followed by Dave and Ron Stockton at 117 years (73+44) and Raymond and Robert Floyd at 110 years (72+38). Charles Schwab Cup winner Bernhard Langer, who won five tournaments on the Champions Tour in 2014, will also return to the PNC Father/Son Challenge, with son, Jason. They will be joined by defending champions Stewart and Connor Cink, NBC Sports analyst Johnny Miller and son, Andy, and a field of greats who amassed 452 worldwide victories and 59 major championships. The family-oriented event, held for 15 years from 1995-2008, made a return in 2012 with a new title sponsor in The PNC Financial Services Group, Inc. The Cinks return alongside past winners and legends of the game including Larry Nelson (2004, 2007-08), Langer (2005-06), Hale Irwin (2003), Floyd (1995, 1996, 1997, 2000, 2001) and Nicklaus (1999). Miller, who last played with his son Scott in 2006, returns to the tournament after an eight-year hiatus. Golf Channel and NBC’s broadcast team will comprise Steve Sands and Gary Koch in the broadcast booth, joined by Peter Jacobsen from an on-course tower, and Roger Maltbie and Notah Begay III reporting from the course. Jimmy Roberts will conduct post-round interviews and deliver his signature essays. The 2014 field also boasts 452 victories across the PGA and European Tours, including 59 major championships, and 14 World Golf Hall of Fame members. Over the 16 years of the tournament, 23 World Golf Hall of Fame Members have participated, averaging 68 percent of the professional field each year. Tickets are still available by visiting pncfathersonchallenge.com or by calling 407-.761-5763. Children age 15 years and younger receive complimentary admission with an accompanying adult.